DEC has filed a Notice of Proposed Rule Making to amend 6 NYCRR Part 49 to clarify the current size limit provisions in regulation for the taking of bay scallops. This proposal will amend Section 49.1 to clarify the legal-size limit in regulation for the taking of bay scallops which requires that only those scallops measuring no less than 2 ¼ inches from the middle of the hinge to the middle of the bill and having an annual growth line may be taken. This rule making will be subject to a 45-day public comment period. For further information please contact the person listed above. Published Notices in the December 6, 2017 issue of the Environmental Notice Bulletin, indicated that public comment would be received until 45 days after publication of the Notices. The public comment periods for these Notices have been extended until February 5, 2018. 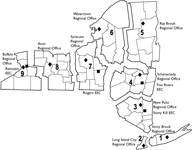 NYS DEC is proposing a new 6 NYCRR Part 492, Climate Smart Community Projects, describing "clean vehicle projects" and "climate adaptation and mitigation projects," authorized by Environmental Conservation Law §§ 54-1511, 54-1521, and 54-1523. The public is invited to submit written comments on the proposed Part 492 through February 5, 2018. Written comments can be submitted to the contact listed above. DEC invites the public to comment about a proposed remedy to address contamination related to the Schmuckler's Dry Cleaners Site (New Rochelle, Westchester Co.), within New York's Brownfield Cleanup Program. Comments about the proposal will be accepted through February 5, 2018. Project documents can be reviewed at: New Rochelle Public Library, 1 Liberty Plaza, New Rochelle, NY 10801; phone: 914-632-7878. A joint meeting of the NYS Invasive Species Council and Advisory Committee will be held on Wednesday, February 7, 2018 from 10:00 a.m. to 2:00 p.m. at the Peebles Island State Park Visitor Center, located at 1 Delaware Ave No., Cohoes, NY 12047. Any person interested in making a comment is encouraged to attend the public hearing on February 7, 2018. Written statements can be submitted by mail to the attention of: Charles Cranston, NYSDEC Environmental Permits, 182 East Union, Suite 3, Allegany, NY 14706-1328 or by E-mail to R9DEP@dec.ny.gov Deadline for written comments is Monday, February 12, 2018. Note: In the event the Frewsburg School District closes for the day or closes early due to weather, the hearing will be rescheduled to Thursday, February 8, 2018. Would you like to support the expansion of green businesses in your community? Local leaders can play a key role in helping green businesses thrive in their communities through planning, outreach, and incentives. Two programs available in New York to support businesses in becoming more sustainable are DEC’s New York Green Business program and the Green Business Partnership. This Climate Smart Communities webinar will describe the benefits of promoting and participating in these two programs. Speakers will discuss how local governments can leverage these programs to support the growth of green businesses in their communities. Attendance at this event is only available online. Please see the URL under "Additional Information" for details on how to use your computer to connect the webinar.